Previous blog posts notwithstanding, we don’t spend every free moment careering about the back roads of rural France and Italy, pausing every few hours for an under-the-olive-tree feast. Truth is, we almost never go on picnics unless we’re on vacation or on a biking trip. Trying to find time when everyone’s schedule meshes during the day is like trying to plot when when three or four different orbiting satellites will pass within shouting distance–not impossible, but requiring more math and determination than any one of us can muster. We’re as overbooked as you are. Which is why when we do manage to find the time, having something special – other than what’s on offer from a gourmet deli – becomes all the more important. Enter Poached Salmon with Chipotle Yogurt. Do you remember the first time you tasted Roquefort? Heheh. Me too. Took awhile, didn’t it? Roquefort, like bottarga, scotch and uni, is one of those tastes that waits for your tongue to grow up. Ideally, you have your first Roquefort with someone who will hold your hand, steadfast as your eyes water, until sufficient sensory signals from your tongue accumulate in your brain to ignite Roquefort-appreciation synapses, and they in turn link together in a blazing neuro-culinary ah-ha moment. Which, given the components of this week’s recipe – fat, sugar, salt – they are sure to do. Poached Pears with Honey Walnuts and Roquefort Ice Cream, is a very easy dessert, but one for the big people. It is also, for those hesitant about blue cheese, an excellent introduction, since only a small amount is used, and that is mashed into vanilla ice cream. The swallows of San Juan Capistrano return to their California mission home every March 19th, one of the natural world’s cyclic wonders. Nature, however, may have had something rather less dependable in mind with the annual spring running of shadfish. Last year we posted about shad roe on March 31st. This year, we’re only a couple of weeks shy of June. Shad roe is an ephemeral treat, briefly available on short notice, then vanishing, so when the season arrives you have to stay on you toes, prepared to swing into action at a moment’s notice. I found three seafood stores had the roe… yesterday. A single purveyor* had it the day I wanted it, one day before blogging. So if you’re inclined to make this weeks’s Tagliatelle with Shad Roe, Pancetta and Peas, finish reading this and immediately pick up the phone. If your favorite fish vendor doesn’t have the roe today, he may be able to get it for you tomorrow. Next week you might still get lucky, or not. That’s the way shad rolls. We’re on an egg roll these days. 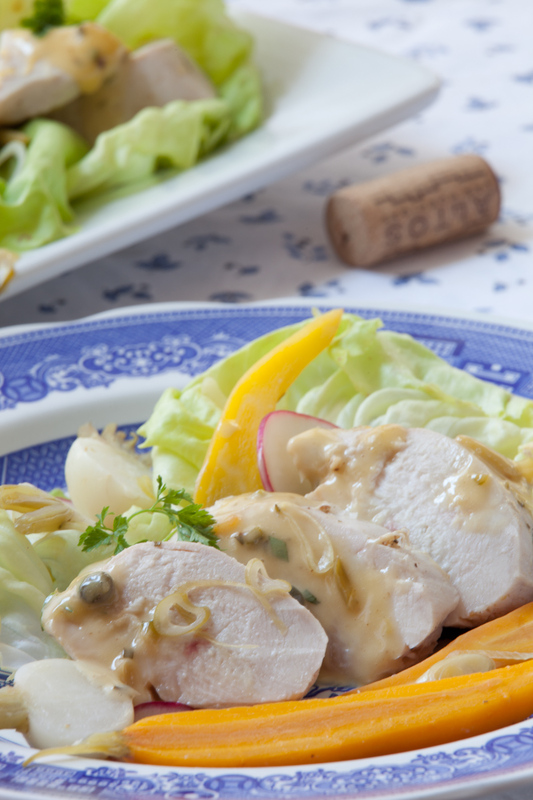 Last week zabaglione, this week Poached Chicken Breasts with DIY Mayonnaise–and next week… well, you’ll just have to check back next week. One hint, picnic. And no, I’m not talking about deviled eggs. As a younger–and thinner–man, I used to make mayonnaise a lot. I also used to eat chicken breasts. Then the original “white meat” took over the world as the healthy convenient food of choice and I just walked away in search of tastier pastures. I can’t explain why I stopped making mayonnaise, except to say that after I got involved in the restaurant biz, we just drifted apart. So here we were, decades later, bumping up against each other. Can you ever really go home again? I wanted to find out.